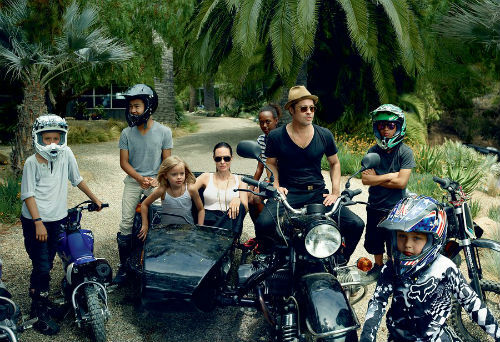 –Angelina Jolie and Brad Pitt just started their By the Sea Oscar campaign by posing with their kids in the new issue of Vogue. I love how this dropped without anyone knowing it was coming. She talks about working with Brad on the new movie (“the worst idea”), planning trips with her kids, and her decision to have pre-cancer surgeries. I love how focused and centred she sounds. I still remember that Esquire interview with her from 2007 that made me convinced she wasn’t going to live past 35. Thrilled I was wrong. –Jessica Chastain did what we all would do if we were in her shoes; she once pretended to be Bryce Dallas Howard to reap praise. -Meanwhile, the co-creator of Degrassi is refuting Drake’s claims that the show made him choose between being an actor and being a singer. -Karma! Bill Cosby has lost three more honorary degrees. –Kate Hudson and Nick Jonas are still icking us out. Neither of them are going to talk about it though, which is more than fine by me. -Sometimes I think Ellen is just trolling us. Like that time she just got Justin Theroux a life-sized blow up doll who looks like Jennifer Aniston. Like, what? I can feel my mother’s scandalized vibes from across the country. -Also, Justin played the kid in that viral UCONN mac and cheese video on Kimmel last night. -Meanwhile, Tom Hanks continues to prove why he’s the best late night guest. -His son, Colin Hanks, is currently promoting his new doc on Tower Records. I’m so glad he got it off the ground; I remember him talking about this on a Nerdist podcast five years ago. -I kind of loved Vanity Fair’s untold story of the Ermahgerd Girl. –Cate Blanchett thinks wage inequality talk is “boring” and just wants to get on with it and pay women the same as men. –Emily Blunt is also tired of all the Hollywood sexism talk, but that’s because she says talking about it makes it worse. Um, no. -Meanwhile, this is the best thing I’ve read about Jennifer Lawrence‘s pay gap essay. –Ann Coulter took down Raven-Symoné and it kind of made me like her for half a second. What? -This is such a great profile on Brie Larson. She’s about to explode. -Here’s the first trailer for Experimenter, starring Peter Sarsgaard and Winona Ryder.